Aside from their deep golden color, no one will guess these moist, tender, absolutely delicious muffins are 100% whole wheat. 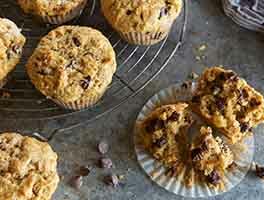 Baking gluten-free? For great results, substitute King Arthur Gluten-Free Measure for Measure Flour for the whole wheat flour in this recipe; no other changes needed. 25 mins. to 32 mins. Preheat the oven to 400°F. 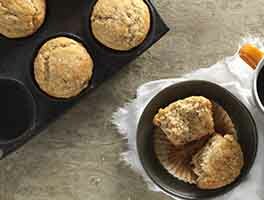 Lightly grease the cups of a standard muffin pan (12 muffins); or line with paper baking cups, and grease the paper cups. Whisk together all of the dry ingredients; stir in the blueberries last. In a separate bowl, whisk together the vanilla, vegetable oil, and buttermilk or yogurt. Spoon the batter into the prepared muffin cups, filling them full. A slightly heaped muffin scoop of batter is the right amount. 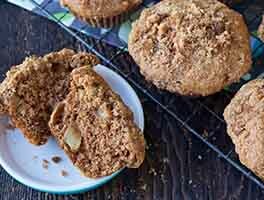 Sprinkle the tops of the muffins with coarse sparkling sugar or cinnamon sugar, if desired. Bake the muffins for 18 to 20 minutes, until a toothpick inserted into the middle of one of the center muffins comes out clean. Remove the muffins from the oven, and after 5 minutes (or when they're cool enough to handle) transfer them to a rack to cool. Serve warm, or at room temperature. Store leftovers loosely wrapped at room temperature for several days; freeze for longer storage. Want to make mini muffins? This recipe will make about 3 dozen small muffins. Bake in a preheated 400°F oven for 9 to 10 minutes, or until a toothpick inserted into the center of one of the muffins comes out clean. Can you substitute yogurt for buttermilk? You can, but please be sure to use standard yogurt, not Greek-style. The batter will be thicker with yogurt than with buttermilk; resist the urge to add additional liquid. For muffins with deep blueberry flavor and color, substitute ¼ cup (30g) blueberry powder for ¼ cup (28g) of the flour. 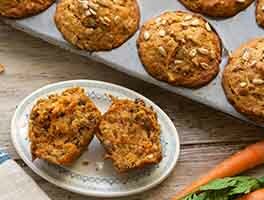 I loved these muffins, and I will make them again! The only change I made to the recipe was to reduce the sugar. I used 2/3 cup raw sugar instead of 1 cup brown. They were plenty sweet even with this change. I used buttermilk, and I sifted the flour before measuring. It was ok but liked the Build your Own Blueberry Muffin Recipe better. What happened to it? The addition of yogurt was good. Super delicious. 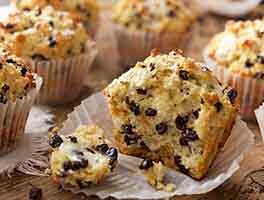 Next time I'm going to try the buttermilk granola muffins which are exactly this recipe with granola. I think it will be even more delicious with the extra chewy bits. I am a professional Pastry Chef/Baker of 24 years. Used organic Whole Wheat flour and added 2TBSPs if Lemon Zest . Really wholesome and no eggs . Great mid-morning muffin . Made them and liked them so much, I'm about to make another batch. Freezes beautifully. I made a few changes. Added 1/2 ts nutmeg. Used a TB of apple cider vinegar to milk to make "buttermilk" . Used olive oil instead. Used a scant 1/2 C brown sugar and a scant 1/2 C of coconut sugar. These turned out awesome!! Yum! Baked as written, my husband liked them very much. They are a little earthy for my taste. Probably the 100% whole wheat. They did bake up nicely, not too dense. I did need to make altitude adjustments. Best whole wheat muffin recipe I've ever made!! I substituted chocolate chips for the blueberries only because I wanted a chocolate chip muffin. This will be my go-to recipe for muffins from now on & I'll just substitute different fruits & spices. I was also leery about the lack of eggs in this recipe & was convinced it was just an error & they left them out of the ingredient list but I did not use eggs & they turned out amazing!!! I made this using frozen blueberries, buttermilk substitute (Lemon juice + whole milk) and followed the option to top with coarse sugar. These are really, really good! the whole wheat flour (I used 100% whole wheat, because I didn't have white whole wheat on hand) is a perfect backdrop to blueberries--who knew? They're sort of nutty, earthiness makes the blueberry taste pop. 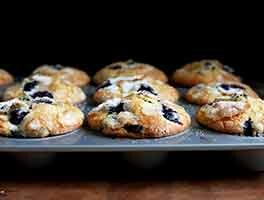 These may be my new go to blueberry muffin recipe. Made this one for the grand kids one evening and the whole family really loved it! Keep getting asked to make them again.